As I mentioned in an earlier post, I am participating in the Z to A Blogging Challenge during the month of May. 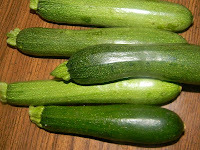 Today is all about the letter Z--and Zucchini is one of my favorite Z words. Whether fried, grilled, baked or mixed up in zucchini bread--zucchini is a frequent dinner guest in our house. Zucchini does have a way of being too plentiful when it's in season and this recipe for zucchini fries baked in the oven is a healthier, easy way to use up some of a bumper crop. It's also "dippable"--making it a great kid-friendly food. Preheat oven and prepare baking sheet. Preheat oven to 425°. Lightly coat a baking or cookie sheet with olive oil cooking spray. Create bowls for dipping and dredging. Place the beaten egg whites into a small bowl and the breadcrumb mixture into another shallow bowl. Dip and coat the zucchini fries. First dip a zucchini strips into the egg white bowl—and then roll it in the bread crumb coating ensuring that the entire fry is coated with breading. As you finish coating each strip, place it onto the prepared cookie sheet. Bake and serve. Bake the zucchini fries at 425° for 16-20 minutes or until golden brown—turning the fries half way through the baking time. Add desired amount of salt when the fries are hot from the oven. Serve warm with a dipping sauce. One daughter prefers ketchup, another marinara, and a third likes Alfredo Sauce…I am generally not a “dipping sauce” fan—but, the husband and I will probably opt for cocktail sauce for an extra kick of spice. So ends my first Z to A Blog Challenge post...tomorrow brings Y! I don't like zucchini by itself, but this almost looks good, even to me. I do love zucchini bread, though.